Digging for Mussels: Artist Code: 1510a. Completed 3 May 2015. Original SOLD at the 2016 Art4Africa Exhibition, Keysoe, Bedfordshire. Original Acrylic on stretched deep box canvas. Unframed size 16” x 16”. Handmade wood frame mauve coloured matt finish, 17” x17”. I painted this picture to get a feel for painting with acrylic (as I had never used this medium before) in readiness to produce an artwork (Artist Code 1510) for the ‘Pint of Science’ lectures in Cambridge Pubs, May 2015. 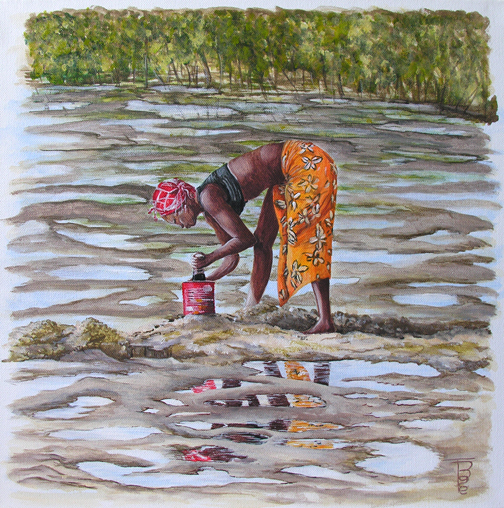 Resource pictures were supplied by ‘my scientist’ (of which there were around 45 in Cambridge) Dr Helen Scales, which included this Gambian lady harvesting/digging for mussels in the mangrove forests. 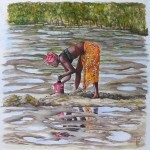 I liked the lovely bright colours of her clothing and the reflections in the puddles of the mud-flats. I chose this particular design to try my hand at this new medium because the content reflected what I decided to design and paint for the main artwork which complemented the lecture given by Dr Scales. It helped a great deal to have a practice, although I have not warmed to this medium and probably will not use acrylic unless asked to by commission. A little poem for 1510 and 1510a.